I came across this article two days ago and had to wait to authenticate it. 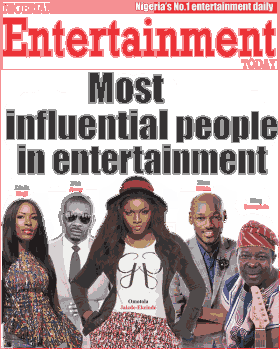 The list of Most Influential People in Nigeria’s Entertainment Industry was dropped by NETng and I agree with most of it. They are artistes, actors, thinkers, entrepreneurs, and captains of Ddindustry. Their ideas spark dialogue and dissent and sometimes even controversies; their works shape lives, habits and societies; their actions have led to some of the decisions that have stirred the industry in its current direction. These remarkable men and women, with lasting and laudable influence, do not necessarily make the most popular people in the industry, but their actions carry a lot of weight; with the hope of the future resting on their shoulders. 2face Idibia: From his artistry to passion for change, the Pop king of Africa has continued to use his music as a muse to influence all. Through his foundation, ‘ 2face Idibia Reach-Out Foundation’, Idibia, an icon by every definition, has dedicated a great amount of time, effort and resources towards reaching out to fellow humans in need. Alex Okosi: As Senior Vice President and Managing Director of Viacom International, Africa, Okosi continues to showcase Africa to the world and vice versa with the MTV, BET, Nickelodeon and Comedy Central platforms. Okosi is one of the top dogs determining the present and future of entertainment on TV. Ali Baba: Still at the top of the food chain when it concerns comedy in Nigeria, Ali Baba, a pioneer stand-up comedian is not only responsible for making the trade profitable, he continues to use his influence to hold up the platform for others to shine. Amaka Igwe: A strong pillar in Nollywood, Igwe’s undying love for motion picture has helped her carve a niche for herself whether with her famous soap operas or her annual BOBTV TV expo. Her Lagos-based radio station, Top Radio has also become a force to reckon with. Amin Moussalli: The Lebanese boss actually started doing business in Nigeria as far back as 1975 with his AIM architectural company but his love for broadcasting drove him to create radio stations Cool FM, Wazobia FM and later on Nigeria Info with his daughter Evita in the helm of affairs. These stations have become one of the biggest outfits in Nigeria reaching millions in four different cities. Audu Maikori: It’s been rocky times at Chocolate City in the last seven months but Maikori, a lawyer and entrepreneur has shown nothing but exemplary skills in stirring the entertainment label through murky waters. With A-list acts like M.I. and Ice Prince, Chocolate City still remains one of the biggest music labels in Africa. Don’t be surprised if they announce an IPO soon. Ayo Animashaun: Through his Smooth Promotions company, Animashaun, 43, has launched some of the most relevant entertainment platforms including ‘ The Headies’ and the 24-hour channel ‘ Hip TV ’ which launches on DSTV this month. Bolanle Austen Peters: Peters is the soul of Terra Kulture – a highly recognised cultural hub set up to promote the richness and diversity of Nigerian languages, arts and culture. Respected for enabling the sustenance of live theatre in Lagos, she’s now executing the big-budget SARO musical that’s already receiving critical acclaim. In eight years of existence, Terra Kulture has organised no less than 60 plays, over 100 exhibitions, and approximately 10,000 children have been through their language, culture clubs and excursions. Biola Alabi : Managing Director a t M-NET Africa over the last four years, Alabi has engineered the process of bringing top African content to our doorsteps. This year, she birthed the successful and well rated African Magic Viewer’s Choice Awards ( AMVCAs ). Chika Nwobi: Nwobi is a serial entrepreneur. From MTech- a leading mobile content company in Africa to Jobberman.com-West Africa’s most popular jobs portal to Cheki.com.ng-Nigeria’s leading cars/autos website to Kamdora.com a fast growing e-commerce fashion retail business in Nigeria, Nwobi has successfully built mobile and internet-related companies; using unusual techniques to link IT with entertainment while delivering value for consumers and helping Telcos excite a generation in love with music. Chris Ubosi: He is the CEO of Megalectrics Limited, owners of Premium choice BEAT 99.9FM, retro-styled Classic FM 93.7 and pidgin-speaking Naija FM 102.7, which have all continued to dominate their respective fields. Ubosi, who seems to be warming up to the cameras nowadays has also launched a sister station in Ibadan and will be setting up a TV channel real soon. Clarence Peters: Three of out every five videos seen on Nigerian TV is directed by Clarence Peters. As the CEO of a record label called Capital Hill Records and a multimedia content creation company called CAPital Dream Pictures, he has shot a good number of videos, documentaries, TV commercials, short films and TV features. Clarence is no doubt the most sought after video director in the music industry so much that his name has become synonymous with top quality musical videos. D’banj: In the last 12 months, the self-styled entertainer has brushed off any kind of doubt about whether he can progress career-wise after his split with former Mo’Hits partner Don Jazzy. Whether it’s performing at the finale of African Cup of Nations, collaborating with US artistes, headlining Hennessy Artistry or becoming the face of the Bank of Industry, D’banj has shown constant sheer determination and dominance. And there’s an indefinitely long list of young cats praying day and night to have a quarter of his blessings. DJ Jimmy JATT: He is rated as one of the biggest and most iconic deejays in Africa. An innovator, teacher, speaker and performer, Jimmy Jatt has helped nurture the careers and influenced many deejays in Nigeria. There’s hardly any hiphop artiste in Nigeria that doesn’t pledge allegiance to the legendary but unbelievably humble deejay. Don Jazzy: From music production, Don Jazzy remains one of the most relevant entertainment personalities in Africa (a formula his colleagues have not been able to crack yet) with every artiste out there asking for a beat or two from him. Little wonder he keeps bagging multimillion Naira endorsement deals. An ambassador for Loya Milk and MTN, IDJA is the producer every producer wants to be like, the pop star who has no single to his name; the enigmatic music maker that’s giving an entirely new definition to impresario. Edi Lawani: Sometimes referred to as the Godfather, Lawani has built a name in the corporate and entertainment scene working as technical consultant, events manager and adviser to organisations and talent. His agency, Showbiz Network is one of the longest running homegrown entertainment organisations, and many of today’s big names in technical support and events management have the bearded gentleman to thank. Efe Omorogbe: The co-founder and HNIC of Nigeria’s leading talent management company, Now Muzik, Omorogbe continues to be a major force in the development of entertainment in Nigeria. He recently setup Now Muzik en.Core, a sister company which handles events and campaigns. Emeka Mba: A former Regulatory Affairs Manager at Multichoice Nigeria and later Director General of the Nigerian Film and Video Censors Board (NFVCB), Mba’s recent appointment as Director-General of the National Broadcasting Commission (NBC) was met with applause from stakeholders who understand what he brings to the table. The NBC is the regulatory body for broadcast organisations in Nigeria. Femi Ayeni: Ayeni, founder of Ultima, the company which owns two very big franchises in Nigeria might not have a popular name but his shows Project Fame West Africa and Who Wants to be a Millionaire. Though quiet and publicity shy, Ayeni has handed many successful entertainers their careers – that list will include Iyanya, Chidinma and Frank Edoho who rose to national fame on WWTBAM. Femi Kuti: The son of the late great Afrobeat legend has clearly carved a niche for himself, warming up nicely into contemporary music (working with Wizkid, LNC, Jesse Jagz, Durella) and modern TV (Kuti is a judge on Nigerian Idol). These have however not shut him up from voicing out his opinion against bad governance. Funke Akindele: The Nollywood actress has bagged the highest number of endorsement deals and produced more bestselling movies than anyone in her category. Her hilarious character, Jenifa has now become one of the most popular characters in Nollywood. And despite going through a well-publicized separation, Akindele’s image remains intact, her following unaffected; her endorsements intact. Genevieve Nnaji: Hardly can you mention top actresses in Africa without placing her in the top 2. US talk show host, Oprah Winfrey described her as the Julia Roberts of Africa, while Elle magazine recently profiled her as one of the 7 international acts soon to cross over to international success. Nnaji’s profiling on the international scene has been a big boost to her career, although she has slowed down on local appearances in recent times. Ibinabo Fiberesima: She became the first woman to lead the Actors’ Guild of Nigeria when she was sworn in as President in November 2012. Ibinabo Fiberesima, an actress and a former beauty queen now presides over one of the most influential organisations in Nigeria’s entertainment industry. Jason Njoku: By creating the iROKO triad- iROKOtv, iROKING and IROKtv , he is credited for creating what the international media has described as the ‘Netflix of Africa,‘ Njoku has combined technology and creativity to satisfy the ever-growing needs of Nollywood fans across the world, ranking in the Forbes ‘African millionaires to watch’ list. His idea now caters for millions of Nigerians who chose to go online to source music and Nollywood movies. King Sunny Ade: A perfect example of consistency, King Sunny Ade boasts of a career that has spanned over five decades. KSA is an important voice in the Nigerian entertainment industry particularly in regards to music as he uses his influence, contacts and resources to affect major decisions in many of the music organisations; while serving as mentor and inspiration to many. Kunle Afolayan: He is one of the most prolific film directors in Nigeria. From his debut production ‘Irapada‘ to the critically reviewed action-drama ‘ Figurine‘, the accounting graduate has shown finesse in all his work. His recent project, October 1, still in the making has generated the most publicity-ever for a yet to be released flick. Afolayan is seen by many pundits as the face of ‘new Nollywood’. KWAM 1: A prolific recording artist, KWAM1 updated the Fuji style incorporating Western instruments to give it that youth-oriented theme. That singular innovation opened up the genre to a hitherto uninterested segment. With a career now spanning over three decades, the self-acclaimed King of Fuji music continues to influence and appeal both the old and young in fuji other genres. Linda Ikeji: From gossip to breaking news stories, Linda Ikeji’s blog has become a hotspot for many online readers. From a business and career that has taken her seven years to build, Miss Ikeji’s blog has become a phenomenal success earning her millions in annual turnover; building a profile as Nigeria’s most successful blogger. What that means? The bachelorette now belongs to the elite group of opinion moulders and news shapers. M.I: They call him the Chairman. Jude Abaga aka M.I. has set a standard for aspiring rappers, for being able to appeal both to the so called hiphop heads and those with no idea in the world what the art form is about. He is sometimes regarded as the best rapper in Nigeria and has a lot in fan base to show for it. Mo’ Abudu: Following the huge success of her talk show ‘Moments with Mo‘, Mosunmola Abudu has built for herself a strong repertoire. Often referred to as the Oprah Winfrey of Africa, her show for years enjoyed high ratings on DSTV. Recently she launched her own channel, EbonyLife TV, Africa’s first global black entertainment network. Omotola Jalade-Ekeinde: As one of the most decorated actresses in Africa, Omotola’s scored a bygone when she made it to TIME magazine’s 2013 edition of the ‘100 Most Influential People in the World’. Her TV reality series, ‘Omotola: The Real Me’ generated a landmark viewership on M-NET’s Africa Magic when it debuted, and the mother-of-four is now warming up for international break. Psquare: Sold out shows and tours in Africa, Europe and America, earth shaking hit songs and videos. A multitude of fans stadiums cannot contain. Psquare have been on the top 3 mark for so long it’s beginning to look like their birth right. Peace Fiberesima: For 12 years she has been behind the African Movie Awards (AMAA), gathering movie stars from all over Africa. Fiberesima has positioned the awards show as one of the most credible and consistent honorary shows. Often described as the ‘African Oscars‘, AMAA awards has now become a standard for actors to measure their performance every year. Rotimi Pedro: With Nigerian Idol, X-Factor and Nigeria’s Got Talent grabbing big market shares,Rotimi Pedro, the Optima Media Group‘s founder, is rapidly becoming a major force to reckon with. The sports veteran and his team are delivering entertainment to millions of Nigerians while giving many an opportunity to kick off their careers. And he’s just secured the right to launch Bloomberg here, according to NET findings. Sam Onyemelukwe: He earned the rights to bring the foremost music channel, TRACE TV to Nigeria building it from the scratch. Onyemelukwe, a former country manager for MTV has utilized his experience and knowledge in the terrain to establish TRACE TV as a channel of choice for many young Nigerians. Tajuddeen Adepetu: From what began with creating content programming for several terrestrial TV stations, Adepetu has gone on to establish his own cable TV channel and TV station. Both Soundcity andONTV, popular among young Nigerians, have now become household names when it comes to pure entertainment. Other assets include Spice TV which wil launch as a full channel on DSTV in a matter of months, and social media platform Buddie. The Murray-Bruces: The Murray-Bruces have played many major roles in taking Nigerian entertainment to the next level. Spearheaded by Ben Murray-Bruce, the family has not only succeeded in radio and TV broadcasting, but also made cinema culture fashionable again, with the Silverbird Cinemas. Their ‘ Most Beautiful Girl in Nigeria‘ pageant has lost credibility and popularity, but remains the nation’s leading pageant. Tony Okoroji: Okoroji is one of the most important factors in collective rights management and administration in Nigeria. Working with the Copyright Society of Nigeria (COSON), Okoroji has spearheaded the recognition of mechanical and associated rights, while making sure radio stations, TV channels and others who exploit music pay what’s due rights owners. The jury is still out on whether that segment should be liberalized. Tunde Kelani: A pioneer and veteran by every definition, Kelani’s brilliance in cinematography and storytelling is second to none. With over 20 films made under his Mainframe Productions, Kelani has been setting standards for as long as we can remember. The movie producer/director/writer is one of the major influences in the Nigerian movie industry till date. Uche Eze: She is the popular blogger and owner of fashion and lifestyle blog BellaNaija . BellaNaija remains a one stop shop for single and married women who are interested in wedding news, gossip and fashion. And even though the likes of Linda Ikeji have surpassed her in ranking, Bella remains queen, with enough international acclaim to last a lifetime. Wizkid: At just 23, Ayo ‘Wizkid’ Balogun is a kid whose achievements will make some legends jealous. From an unsure wannabe, the hit-maker has grown to become a superstar, with a strong influence on today’s sound while many teens are feeding daily on his style and- permit us – swagger. Now warming up to be an entrepreneur, Wizzy has it all working.